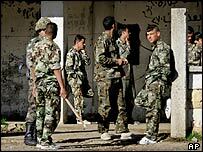 Syrian President Bashar al-Assad has announced the phased redeployment of Syrian forces in Lebanon. Addressing Syria's parliament, Mr Assad said troops would withdraw to the eastern Bekaa Valley and then to the Syrian border. The US said Mr Assad's pledge was "not enough" and called for a full pull-out. Syria has been under intense pressure to withdraw from Lebanon since the February car bomb death of former Lebanese Prime Minister Rafik Hariri. Lebanon's main opposition leader, Walid Jumblatt, called Mr Assad's announcement a "positive start" but demanded a clear timetable for the withdrawal. In the Lebanese capital Beirut, members of the public jeered as they watched the broadcast in a central square. In the nationally-televised speech, Mr Assad said: "We will not stay one day if there was Lebanese consensus on the departure of Syria. "Our way is a gradual and organised withdrawal." He said after the redeployment, Lebanon and Syria "will have fulfilled our obligations under the Taef accord and under [UN Security Council] Resolution 1559". The 1989 Taef accord, which ended the Lebanese civil war, calls for a phased withdrawal of Syrian troops, beginning with redeployment to the Bekaa Valley, while the 2004 UN resolution calls for foreign forces to leave Lebanon. Mr Assad said Syria was not against a full withdrawal, declaring: "The natural place for Syrian forces is Syrian land." The president called Mr Hariri's killing "an atrocious crime... against the unity and stability of Lebanon as well as Syria", and vowed to bring the culprits to justice. The US, however, said Mr Assad's announcement was "not enough". "As President Bush said Friday, when the United States and France say withdraw, we mean complete withdrawal - no half-hearted measures," the state department said in a statement. But shortly after Mr Assad's speech, a senior Syrian minister said Syria would pull all its troops back into Syrian territory. "The matter is very clear. When an army withdraws it withdraws to inside the country's border," Syrian Immigrant Affairs Minister Buthaina Shaaban told Lebanese television. "The political decision has been taken for a complete withdrawal," she said, adding that it will take place "in the nearest possible time". Mr Assad's hour-long speech was punctuated by cheers from legislators and thousands of flag-waving Syrians watching on giant television screens outside parliament. In Beirut, about 1,000 Lebanese watching the speech in a central square shouted "Syria out!" and denounced the Syrian president. The BBC's Kim Ghattas, who is in the Lebanese capital, says what has mostly upset people here is the tone used by Mr Assad. She says opposition figures said there were many veiled threats in the speech and hints that Syria could still use violence to crush the anti-Syrian movement. Exiled Lebanese Christian opposition figure Michel Aoun expressed scepticism about Mr Assad's intentions. "I call on the Lebanese to be very careful about the wording and not to be happy over the general meaning," he told Al-Arabiya television in Paris. Syria's arch foe, Israel, said Mr Assad's remarks "constituted an evasion" of the UN resolution. Israeli Vice-Prime Minister Shimon Peres said Israel could open peace talks with Lebanon if Syria withdrew.